Crews work at the Civic Dr MAX Station, laying the conduit for e-fare card readers that will be installed in the future. Crews have been hard at work for the last five weeks laying the foundation for TriMet’s future state-of-the-art electronic fare system. While the majority of platforms are staying open during the construction, beginning Monday, April 27, the platforms at Pioneer Courthouse Square will close. The platforms are too busy and too tight to safely stay open during the work. Pioneer Square South MAX Station will close first from April 27th through Saturday, May 2ndand Pioneer Square North will close the following week from Monday, May 4th through Saturday, May 9th. The sidewalks next to the platforms will remain open. Expect some noise from saw cutting and excavation during the work. Crews are trenching and laying conduit for e-fare card readers that will go in at a later date. When the e-fare system is up and running, scheduled by the end of 2017, it will make riding buses and trains faster, easier and more convenient. You will be able to pay your fare by simply tapping a transit-only smartcard, a contactless payment card or a smartphone equipped with near-field communication against a card reader. In addition to the Pioneer Square platforms, 7 other stations in the Portland City Center area will require closures during the e-fare infrastructure construction. All are short distances from other stations. During the Pioneer Square South closure, catch MAX Blue and Red line trains at the Library/SW 9th Ave Station or the Mall/SW 4th Ave. When Pioneer Square North is closed, use the Galleria/SW 10th Ave Station or the Mall/SW 5th Station. The 85 other MAX and WES platforms are remaining open during the construction. 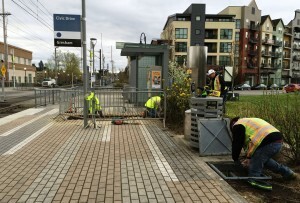 The work has been completed at nine stations with crews moving on to the SE Fuller Rd Station, Clackamas Town Center Transit Center, Parkrose/Sumner Transit Center and Mt Hood Ave Station in the coming weeks, in addition to the Pioneer Square stations. Multiple crews are doing the work in order to complete the initial construction by the end of the year. Visit trimet.org/efare for additional information on the upcoming e-fare system and additional information and schedules for the construction’ or sign up for email updates to get a heads-up on upcoming station closures. We know our riders want more and better service. That’s why, over the next few years, we’ll continue to grow our network of buses and trains—while improving the overall rider experience. The new MAX Orange Line, opening in September, will provide commuters a much-needed alternative to sitting in traffic. Meanwhile, ongoing upgrades to vehicles, stations and tracks are helping to improve reliability and make your ride more comfortable. We’re bringing service frequency back up to pre-recession levels, which means less waiting and less crowding on board buses and trains. And, we’re improving our trip tools so you have access to service information when and where you need it, along with this new and convenient ways to pay your fare.